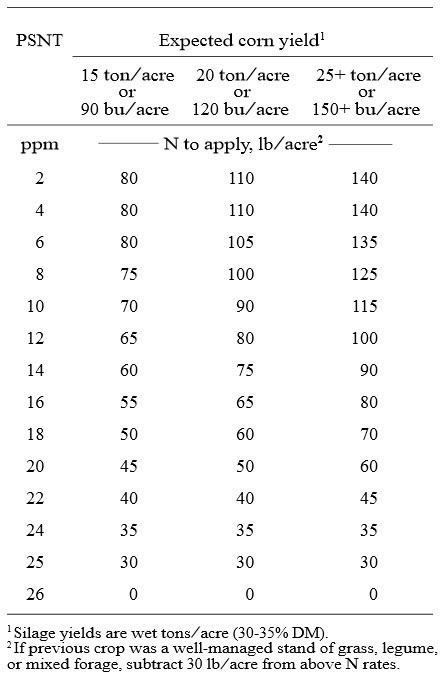 Recommended nitrogen rates for corn based on the Pre-sidedress Soil Nitrate Test (PSNT). Before you sidedress your corn, we recommend doing the Vermont Pre-Sidedress Nitrate Test (PSNT). The PSNT measures nitrate, the main form of nitrogen (N) taken up by plants and an indicator of N available to the crop for the remainder of the season. The PSNT should be taken right before you sidedress, so you can identify if there is enough, too much or too little soil-nitrate for the crop to reach your yield goals. Applying too much fertilizer wastes money and can lead to environmental damage by nitrate leaching into waterways. Applying too little can decrease yields. Sample fields when corn plants are 8 to 12 inches tall, taking 15 to 20 soil cores per field at a depth of 12 inches. Avoid sampling close to where you had banded fertilizer near the row. Take the samples in a zig-zag pattern all over the field so you get a good representation of the area. Do not specifically choose ‘nice’ or ‘bad’ spots – be random. Mix the soil cores together in a clean plastic bucket and place a few handfuls of the soil in a paper bag. For more tips on how to soil sample, check out this link from the UVM Agricultural and Environmental Testing Lab. When in the field, keep the samples cool in the shade or in a cooler. The main reason to keep the samples cool is to prevent microbes that are active at warmer temperatures from further breaking down organic nitrogen, which would give you less accurate test results. Ideally, get the sample immediately to the laboratory for analysis. If this is not possible, dry the sample by spreading out the soil on a paper bag in the sun so it dries quickly. Or, put the sample in a glass dish in a very low temperature oven, less than 150 degrees Fahrenheit until dry (2 to 4 hours should be fine). If drying is not possible, put your samples in the refrigerator. See below for a helpful chart to interpret your PSNT results. If the PSNT is 25 ppm or higher, there is little or no yield increase from applying more nitrogen (Jokela, 2008). The chart comes from the extension publication, Nutrient Recommendations for Field Crops in Vermont, where you can find more information on soil and nutrient management. For more information, contact the UVM Agricultural and Environmental Testing Lab at 802-656-3030, call our office 802-524-6501, or email us at cropsoilvt@gmail.com. This entry was posted on Thursday, June 25th, 2015 at 7:05 am and is filed under Out Croppings. You can follow any responses to this entry through the RSS 2.0 feed. You can leave a response, or trackback from your own site.